Matthew Prescott is a leading figure in the global movement to reform how we farm and eat. He’s Senior Food Policy Director for the Humane Society of the United States and adviser to the Good Food Institute. A sought-after speaker and thought leader, Prescott has spent over a decade and a half sharing his ideas with Ivy League universities, Fortune 500 companies, consumers, and more. His efforts have directly led to sweeping changes in the supply chains of hundreds of major food companies, impacted countless individuals’ diets, and have been covered extensively by the media: his work has been featured by CNN, in the pages of the New York Times, the Wall Street Journal, the Boston Globe, and countless more; his writing’s appeared in USA Today, the Washington Post, Barron’s and others; his photographs have been featured in the Rolling Stone and Food & Wine; he’s been as a guest on national television news programs; and he was even once a guest on NPR’s Wait Wait...Don’t Tell Me. He lives in Austin, Texas with his wife, the author Lara Prescott. 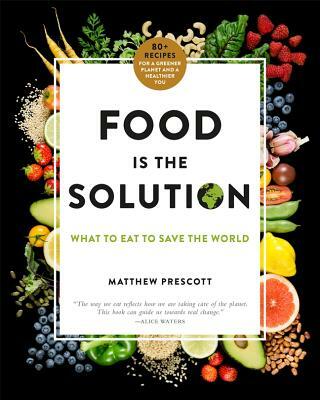 Matthew is the author of Food is the Solution. "Each one of us can help protect the planet when we choose what to eat. It's simpler than you may think! This book will give you all the tools you need." "Changing our diets won't save the world by itself, but we won't be able to save the world without dramatically changing our food and agriculture practices. Matthew Prescott has assembled a detailed and delicious road map to survival." "This book is an important call to action for anyone who eats." "Matthew Prescott proves that food can be delicious while also helping mend the social and ecological fabric of our world."